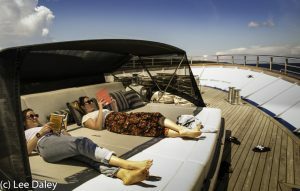 In Croatia, aboard the Katarina Line Futura: As we watched deckside, our small cruise ship anchored alongside the Dalmatian Coast shore of Brač Island and its Golden Horn Beach, known as one of Europe’s most beautiful. Holding just 38 passengers, the Futura’s compact size slips into ports large ships can’t handle. Our eager group of sunbathers easily disembarked and clambered aboard small boats for the short ride to the coast line’s golden sands. Once ashore, my companion and I decided to meander. Sunbathing could come later. A short walk from Golden Horn’s white pebble beach, signs along a tree-shaded promenade pointed the way to the village of Bol. Through the greenery, glimpses of an impossibly blue bay glistened in the sun. Soothing ocean breezes wafted through the pines. We knew we’d made the right choice and were soon astounded to come upon the first of several stunning limestone sculptures. Bathed in dappled sunlight, our path had suddenly morphed into an outdoor sculpture garden adorned with larger than life busts and modern art works. Very few plaques identified the artist or artists. With curiosity aroused, we wondered what surprises awaited in Bol. Our view as we neared the village was another visual treat. 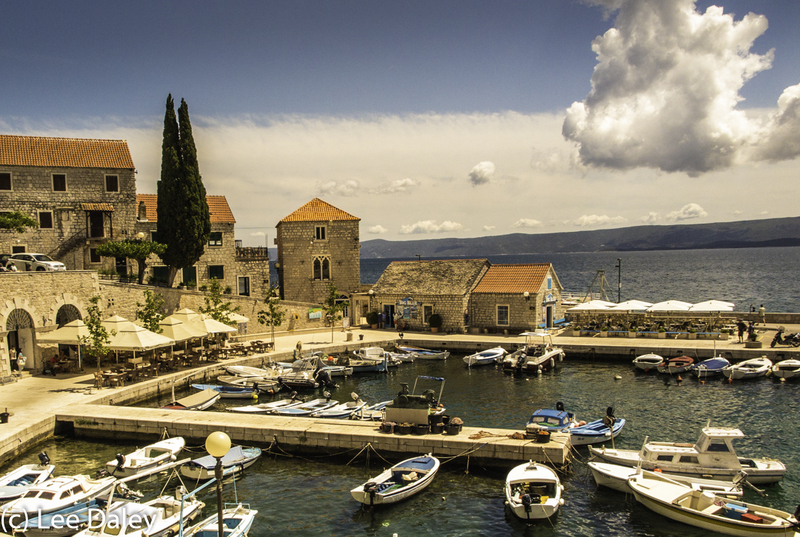 Ancient limestone buildings lined the wharf, throwing the harbor’s heavenly blue waters into sharp relief. 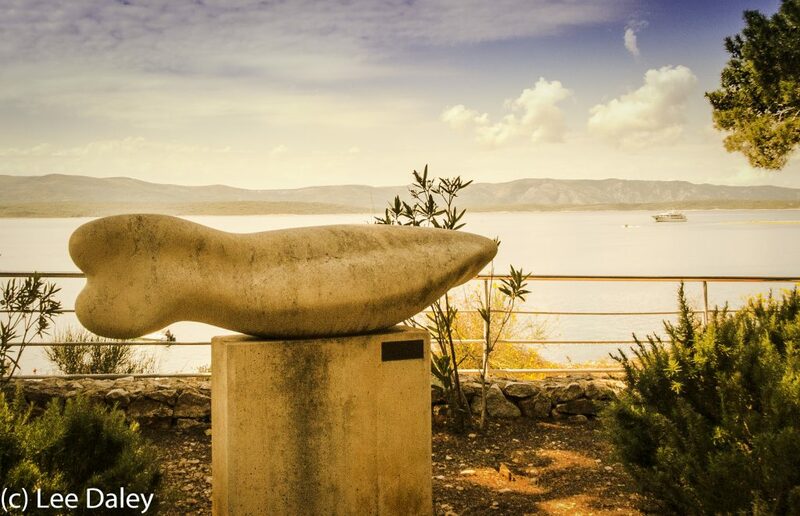 We later learned that Brač Island is home to the famous Pucisca Stonemason School, founded more than 100 years ago to protect the island’s stone masonry tradition which dates from Roman times. In fact, the Romans used the Brač Island marble and limestone for temples, amphitheaters and palaces all over Dalmatia. The fourth century Emperor Diocletian’s 1,700-year-old palace in Split was built from Brač stone (Scenes from the Palace were depicted as the Throne Room in Game of Thrones.) 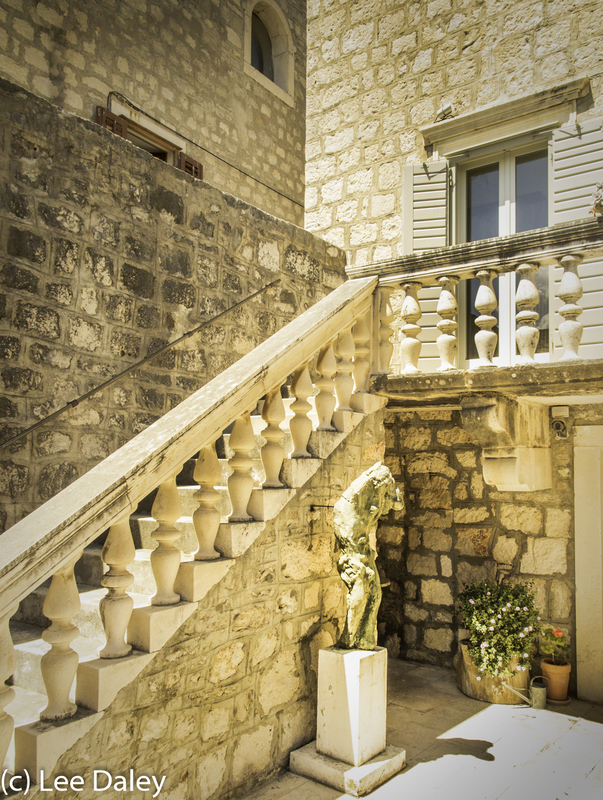 Brač Island stone can be found in the White House and a host of historic European buildings. Sometimes called Brač “marble,” It is actually a beautiful white or off-white limestone on its way to becoming marble but is not yet as hard. Across from the harbor, a row of cafes with outdoor seating, boutiques and galleries led to an opening where a colorful farmers’ market displayed a bounty of the island’s fresh fruit and vegetables. Exchanging welcoming smiles with the local farmer, we plucked ripe peaches and grapes, perfect for picnicking in a nearby pocket park with its shaded fountain and benches. Serendipitous cultural immersion: Along the main waterfront directly across from the harbor, we came upon a building so beautifully fitting to the area, it immediately caught our attention. We entered its open front courtyard to see more.The door inside its vestibule was locked but, arranged within the open entry, free-standing classical sculptures were arrayed. “Was one a Giacometti?,” I wondered. Several sculptures were carved from the same limestone as those we had seen on our walk into town. Through the building’s ground floor windows, we spied intriguing art works displayed and realized the building housed a museum and an art gallery. Suddenly, a young man appeared at the door and informed us the gallery was closed for the day. Disappointed, we thanked him and as we turned to leave, he asked if we had any questions. After a few minutes conversation, we learned Tino Vukovic was the gallery’s curator and that he would be happy to give us a private tour of the collection. A Renaissance Baroque palace dating back to 1694, the gallery displays both traditional and contemporary art by Croatian artists. One room on the ground floor rotates both sculptures and paintings by contemporary artists while the upper floors display the museum’s collections. It was obvious from Timo’s exuberance as he guided us through the exhibits that his job was a joy to him, He was like a kid in a candy store, showing us the influence of van Gogh in one painting and the similarity to the style of Monet in another. We were sure one magnificent bust, sculpted of smooth black marble, symbolized Don Quixote until Timo informed us it depicted a local dignitary created by award winning Croatian artist Marija Ujević Galetović, Through him, we learned of Brač’s strong artistic tradition, most notably in sculpture, stone-working and painting and that the sculpture garden promenade leading into town had been commissioned by the village to showcase sculptures done by local artists. 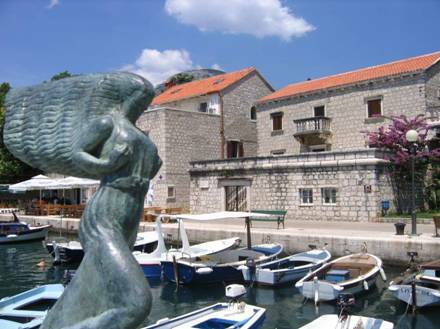 If you should find yourself in Bol on Brač Island, look for the Gallery Branislav Deskovic on the main street. If it’s open, enter and enjoy. 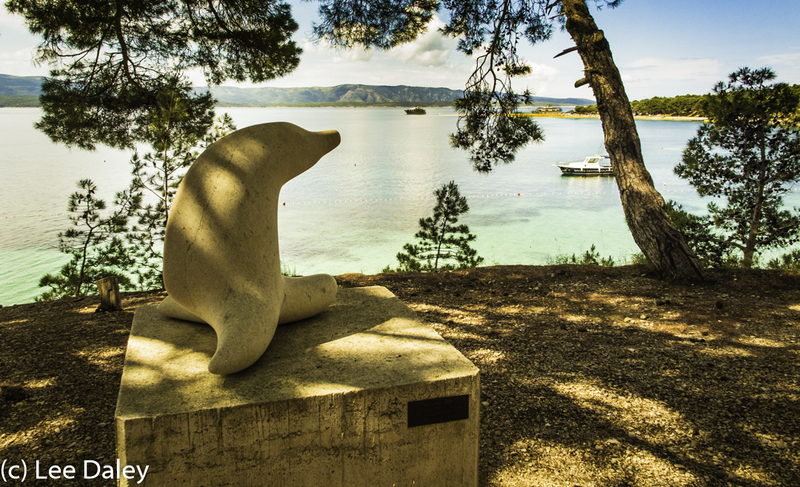 From this artistic tradition came the island’s best-known artist, the sculptor Branislav Deskovic. It is Deskovic for whom the gallery is named. 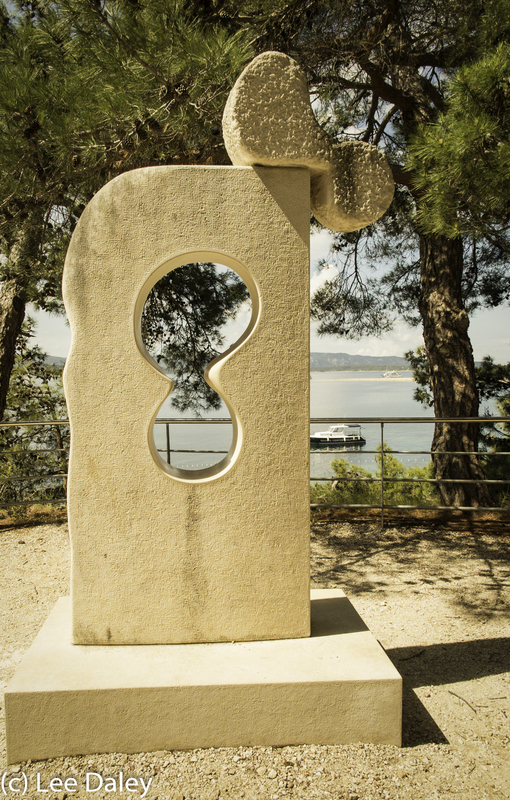 We later learned Deskovic’s beautiful sculptures can be seen all over Bol. It was in the gallery’s entrance that we had admired the sculpture of his dog, depicted scratching its ear. And the Giacommetti-like sculpture? That was another story. 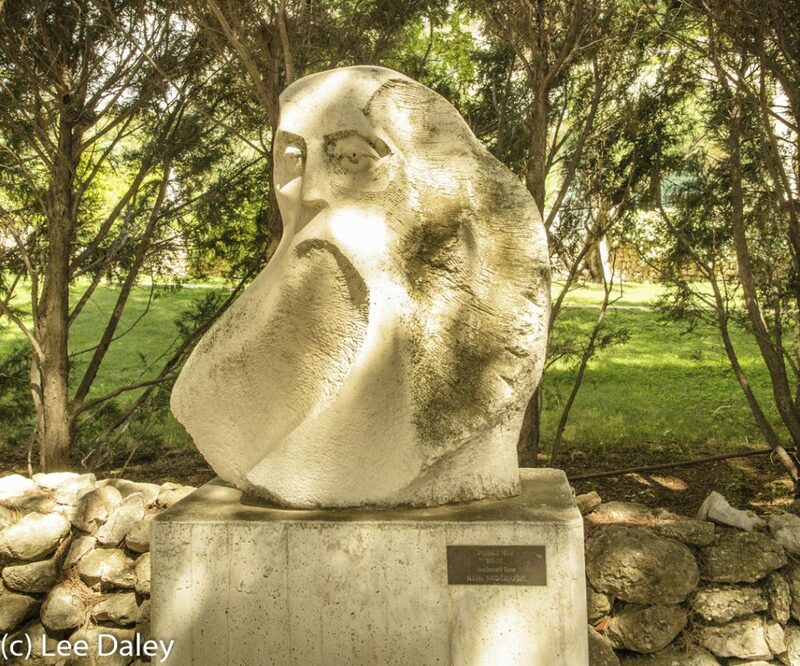 A native of Brac, born in 1922, sculptor and painter Valeriji Michieli lived through the Second World War when islanders fiercely resisted the Italian fascist occupation. 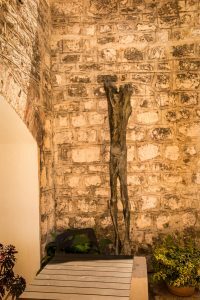 Michieli depicted the suffering of this turmoil through paintings and sculpture. He was inspired in some of his creations by the Swiss artist, Alberto Giacometti. It was not until 1991 that Croatia gained its independence. Taverna Riva to sample the island’s bounty after our museum tour. Located right on the waterfront, (called the Riva) our courtyard table under a sheltering shade tree afforded a stunning view of the harbor. We lunched on freshly caught and deliciously prepared seafood with grilled vegetables. Our server helped us review the wine list and based on his recommendation, we chose the local Stina Cuvee from a Brač vineyard. The blend was 33% chardonnay combined with local grapes called vugava and pošip. 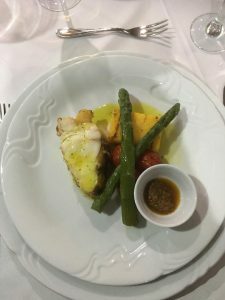 We were in luck because our itinerary that evening included a tour of Stina Winery located in Bol very close to Taverna Riva. 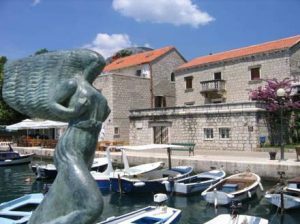 Stina Winery: Housed in an old wine cooperative building right on the Bol waterfront, the name Stina appropriately translates to the word stone in deference to the limestone quarried on Brač Island. The winery tasting room gave us another chance to enjoy Stina’s Posip, 2017, which we had enjoyed with lunch. Young, fruity and fresh, this vintage would pair well with mild cheese and seafood. The cooperative produces three wines, including a Rosé and the Plavac mali made from local indigenous grapes. The long history of Brač has always been marked by the cultivation of grapevines, especially the Plavac mali variety. Back on board the Futura, Chef Jorge outdid himself with a white tablecloth five-course Captain’s farewell dinner accompanied by fine wines. That evening, a local guitar/keyboard duet played popular rock tunes with requests honored for favorites. We were definitely spoiled. Every meal on the Futura was superb. Each morning, a sumptuous breakfast buffet of eggs, fruit, croissants, freshly brewed coffee and tea was ready and waiting in the upper deck lounge with its water views.The bar was always open with snacks available. Nine crew members serve the 38 passengers and were there to field questions whenever needed. 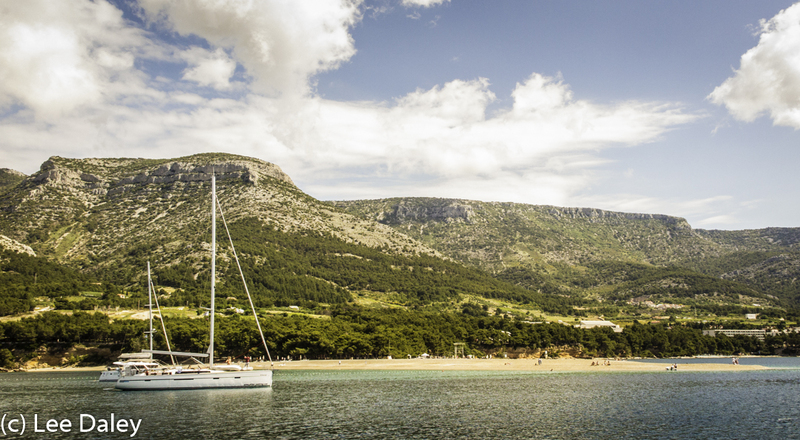 Our four-night cruise included three islands: Hvar, Korcula and Brač. Each was uniquely individual and stunningly beautiful. Our voyage was all-inclusive with all meals including dinner and wine at three up-scale island restaurants featuring fresh, local cuisine. Katarina Cruising Comfort on Deck. because most of the staff have lived there all their lives. With itineraries ranging from budget to luxury, including nine ships in the Deluxe Superior Category and lots to choose from in every price range, they seem to have covered every possible option for a rewarding exploration of the Dalmatian Coast. We booked our hotel lodging through their office prior to departure and they offered transport arrangements from the airport to downtown Split, our departure city. We booked our trip directly with Katarina Line and were extremely happy with all the arrangements. Another Related Article: Santorini, Greece: An Island in Time.